When you are working with a customer invoice, or a vendor purchase order, it is very helpful to have summary information readily available. You want to see information about the open balance, outstanding orders, a history of recent transactions. 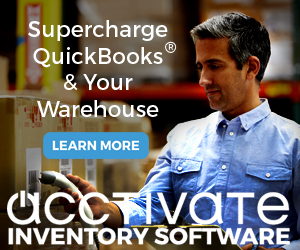 In QuickBooks you have been able to look in the Customer Center to do that, but this requires switching windows and trying to keep windows in sync. 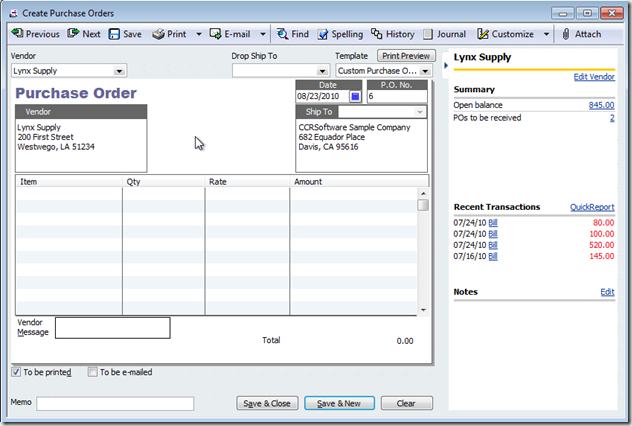 QuickBooks 2011 has improved this process by adding a history pane to the invoice, enter bill and purchase order windows. 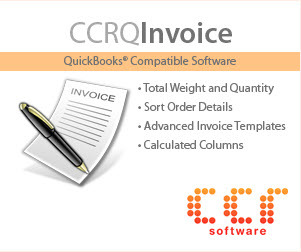 When you create an invoice and select a customer, after a short pause QuickBooks will update the history pane on the right side of the window. This lists summary information about the customer, as well as a list of recent transactions. You can click on that small arrow at the top of the pane to close it – for those of you who have smaller screens and can’t afford that space. You can edit the customer record. Click on the open balance number to see a Customer Open Balance report for this customer. 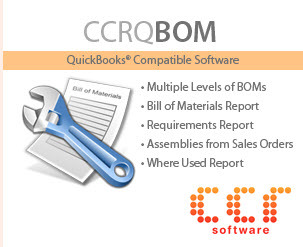 Click on the active estimates or sales orders to be invoiced link to see a Customer QuickReport filtered for that transaction type, or click the QuickReport link to see a full report. 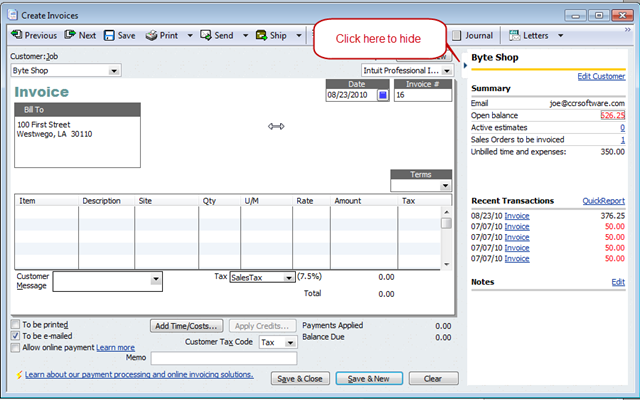 Click on a listed transaction (invoices, estimates, payments and so forth) show a transaction journal report for that transaction. 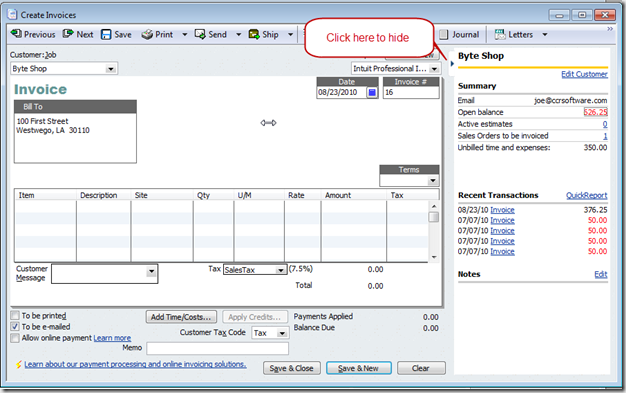 Click the Note Edit link to open the notes field for the customer. A similar history pane is available for estimates, credit memos, sales receipts and purchase orders, but not for sales orders, which I find odd. There may be some other places it is available that I haven’t stumbled across (I just found it on Enter Bills for example) – look for that little arrow to the right of the screen. This is a very useful feature, and Intuit has learned that they need to make these panels optional, so that you can hide them if they take too much space. I think that will be a useful feature. I wish QB would add a scroll bar to the bottom of the sales order, invoice, and purchase order. I have a lot of custom field columns added to sales orders/invoices. The only way to see the information on the far right side of the invoice is to resize/shrink all the columns to the point they are unreadable. The solution would be to add a scroll bar so you can add unlimited custom field columns but retain the column width of each column. It’s great that these can be closed, but I wonder why they didn’t use a floating dock so that it would slide out when you move the mouse to the right side of the screen and slide back in when you left the focus of it. They could have then just given a “pin” option to give the effect they have now for people with more screen real estate. Do you know if that feature can be disabled? I have been playing with my copy of qb11 and I can already tell my users will not want this. It will bother them to have to click on hide button every time the history pane decides to open. When I scroll back and forward invoices, it will stay hidden until I come up on invoice in which I have not click the hide button. The history then stays up even if I go back to invoice that had it hidden before. It would be good to be able to disable that function completely. As Henryk mentioned, there does not appear to be a way to disable this feature. I have no use for this window and I have to keep clicking on the hide button. This is very annoying that we have to constantly deal with this window when we don’t need/want it. I wish this transaction history would work when we are entering a sales order as well. I see it being very helpful! I just want someone to tell me how to desable this panel it make the system extremily slow and we dont need that. Eestribi – you can close it on individual records and it SHOULD stick closed, but it doesn’t always. Best I can say is to use the Feedback option in your Help menu to let them know. A lot of people have complained about this issue, we’ll see what they do about it in a future release, if anything. Sometimes it takes a long time for that info to show up, at least the first time. Other than that, I don’t have a lot to say on this.